It’s the finer details which make all the difference in home décor and surprisingly that includes radiators. After all, these are often visible and take up of space in any room. Surely, they require just as much attention as the curtains or furniture?! Thankfully, with the rise of designer radiators there’s more choice than ever before. No longer are you limited by the standard look of the white radiator but instead have an endless variety of colours, shapes and sizes to choose from. The most suitable and stylish for your living room can depend on several qualities. Here we look at some of those in detail – there’s no excuse to stick with the standard and boring option. Gone are the days where radiators must lie horizontal to deliver that same toasty warmth. Thanks to recent innovations, vertical designer radiators provide a great quality of heat output. 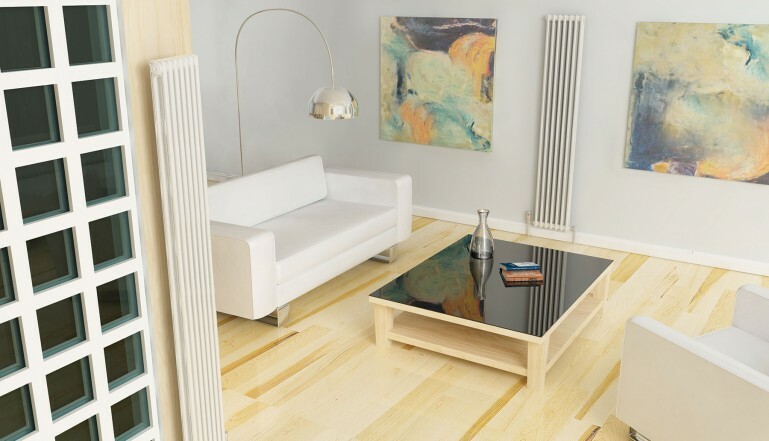 These sorts of radiators work especially well if you’re hoping to achieve a contemporary and minimalist vibe. Given the unique aesthetic, this radiator can also act as a centrepiece. Opt for a stainless-steel radiator for that clean and refined finish. These are also cheaper to run and more efficient at conducting heat than the more cumbersome cast-iron radiators. For many, it’s the practicality of vertical radiators which makes them so desirable. If you’re struggling for space in your living room or simply don’t want to sacrifice an entire wall, this is the recommended choice. The more conventional horizontal radiator can still make a visual impact thanks to the sheer variety of shapes and styles. These are a great choice for larger living rooms as the added surface area can provide adequate warmth even on the coldest of winter nights. Placing this sort of radiator under the window ensures the most optimum heating of the room. This space is most likely where your current radiator sits now, and for good reason. As cold air enters the room from a draught in the window, it’s immediately heated by the warm air of the radiator to then be circulated throughout the room. There’s so many quirky designs available that you’d be hard pushed not to find a horizontal radiator that fits with your home décor. Many radiators now come in a range of colours, a very popular colour is Anthracite Grey which creates a modern and sleek look.